L. A. Little wrote two excellent books on trend trading. In his books, he explained a key timing concept called anchor zones, which is a very useful tool for price action traders. 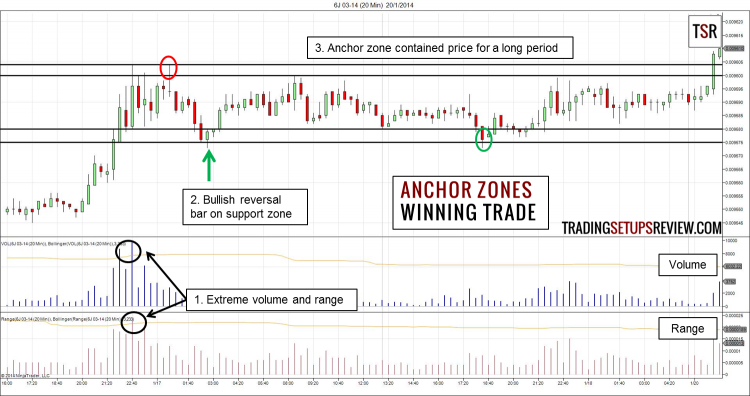 In our review, we will find anchor zones and design a trading strategy around them. However, bear in mind that anchor zones are just a part of L. A. Little’s trading framework. To apply anchor zones in L. A. Little’s trend framework. you must refer to his books. Once you find the anchors bars, you can draw the anchor zones by marking the limits of the bars. The chart below shows how to do it. Find bars with extreme volume, range, or gaps. These are the anchors bars. Draw zones along the limits of the anchor bars and expect price to stay within the zone. For the examples below, we marked out the anchor zones using the same method. The examples in L. A. Little’s books are mostly from the stock market and in the daily time-frame. However, in this trade, we used the anchor zones method on a 20-minute chart of the 6J futures on CME. 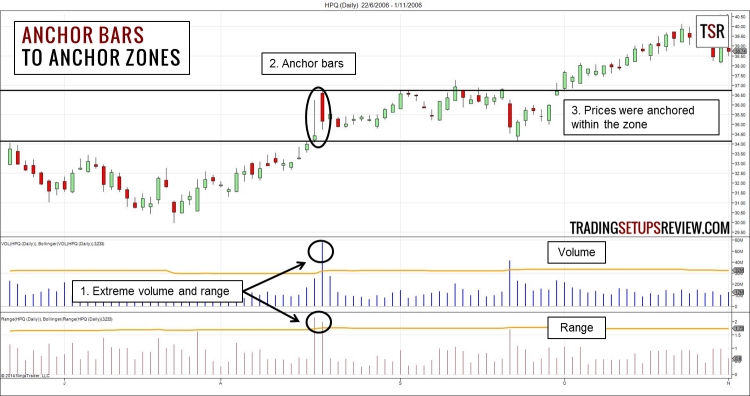 The extreme range and volume highlighted the anchors bars which guided us to mark out the support and resistance zones. The bullish reversal bar that poked slightly below the anchor support zone is our trading signal. We placed a buy stop order on its high. Prices rose and stopped just short of the resistance zone, giving us a enough room for profit. This anchor zone was very successful in containing the price movement. The red and green circles highlight other potential anchor zone trades. This is a daily chart of EBAY. It shows anchor zones that provided some support and resistance but did not lead to a profitable trade. Taking our cue from the volume and range plots, we marked out the anchor zones. Prices fell quickly to the support zone. It held up with a bullish outside bar and inside bar. However, neither bullish patterns had follow-through. Finally, a bullish reversal bar formed on the support zone, and we bought as price broke above it. However, the trade failed swiftly as price fell through the anchor zone to test an earlier swing low. Price action often exhaust themselves with climatic moves. Anchors bars include gaps, wide range, and high volume. These are also signs of climatic moves. Hence, anchor bars are exhaustive moves. 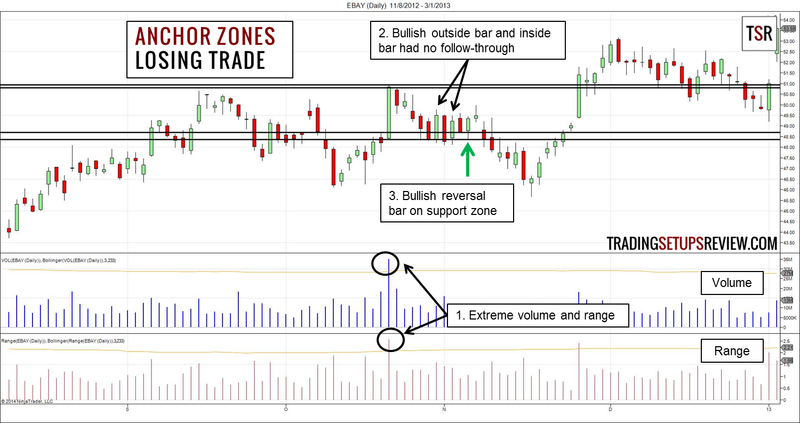 Marking out support and resistance zones with anchor bars is a superb trading method. It integrates price and volume to find key price ranges that work well to contain prices. This concept of anchoring prices with exhaustive moves also work in day trading. 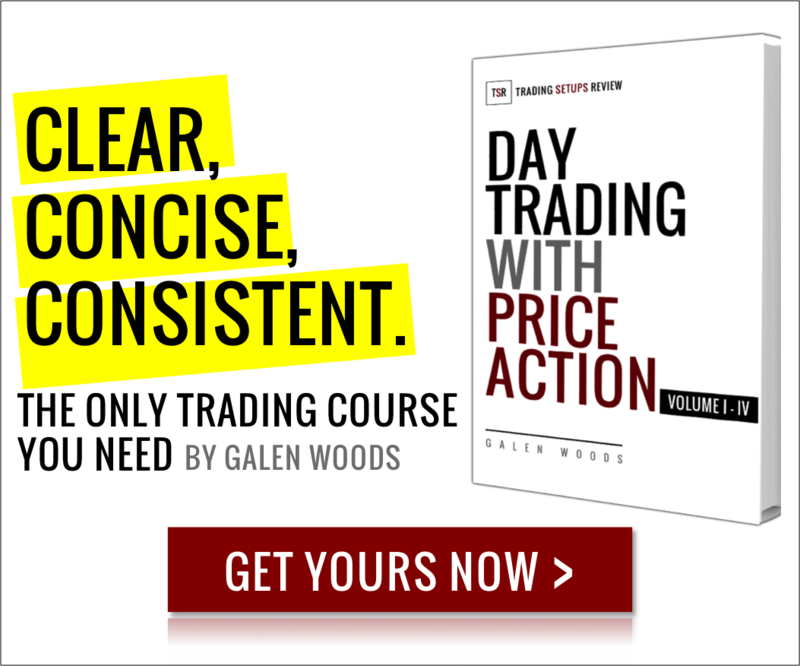 The high and/or low of the each trading session is often formed within the first trading hour. The first hour of the trading day usually has wide range and high volume. Hence, it serves as an anchor for the rest of the trading session. Morning reversal trades and opening range break-out trades work on the same premise. Our trading rules focus on reversal bars as entry signals for simplicity. In fact, you can look out for any candlestick pattern to time the trade. More experienced traders can even enter with limit orders slightly beyond the anchor zones. Using limit orders will result in minimal adverse price movement in successful trades. The stop-loss is tight and the reward to risk ratio is excellent. However, you must have ironclad discipline to exit without hesitation. If you find this anchor zone concept effective, you should see how it works with L. A. Little’s trading framework in his highly reviewed books. Is this strategy for swing trading or day trading? Also, is this strategy best used in a uptrending or a sideways market? Hi Al, I find that it works better for swing trading. But it’s helpful for day trading as well, especially for 24-hour markets like forex. You can use the concept of an Anchor Bar in both trending and sideways market. It boils down to how you use it. You can use it as a signal to exit from a trend or join one at the bottom of the range (assuming uptrend). You can also use it to set S/R levels for fading price swings within a trading range. These are my experience with it. You can learn more about how L.A. Little uses it in his book.